But don't worry! I will be doing an exercise today! A little over a week ago, I posted a blog asking for writing exercise ideas, and today I will be using Lisa's idea of a visual prompt. I love these and am actually quite surprised that I've not done one on here as of yet. Step 1 : Go to this site to generate a few random images pulled haphazardly from the unlimited expanse of the internet. Step 2 : Pick an image that speaks to you. Maybe you think it's funny or poignant... Whatever the reason, pick one. Oliver had always wanted to visit Ireland, and when he finally got his chance, he had taken full advantage of it. He had even visited several tourist traps, buying into the kitschy crap that was almost offensively Irish such as a leprechaun costume complete with a green top hat and ginger beard. His trip eventually ended, however, and he was forced to board the series of planes bound for his home in Albion, Nebraska. But the Irish spirit had not left him even after the jet lag wore off. The next day, as he left for work, he grabbed his comical hat and beard and made his way to the post office, ready and raring to walk his daily route. At first, people were unsure as to how they should react to him, but as the day wore on he was receiving greetings and smiles from the houses he visited. A little Irish never hurt anybody. hah. That one was kind of fun. I think I may do a weekly visual prompt from now on. I had forgotten how much I loved doing these. Consider this the first installment of Visual Prompt Saturday!! ... ... ... Well, that's a stupid name, isn't it? Well, maybe not stupid so much as boooooooooring. Hmm... Will have to do some brainstorming over the next week for a catchier title. If anyone has any lightbulbs, let me know! P.S. 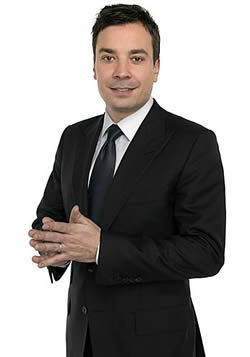 Does anyone else think that Jimmy Fallon's humor is as dismal as I do? I know this is awfully late for a comment, but I've only got to know your blog this week, so I'm excused. I have an idea for visual prompts. Instead of using just one picture, you could get 3 pictures (Say #5, #7, and #13, or whatever works for you) and try to link them into one story!